How is honey good for you? There are numerous ways that honey is beneficial for you. I’m going to cover everything about honey and why it’s so good for you. I’m not sure that everyone knows about every benefit that honey provides, especially when it comes to lowering your glucose levels, but I’ll get into that shortly. We know honey isn’t possible without bees and it provides us with many benefits. It’s truly amazing how nature is and how things are made. Honey is sweet tasting and good to add to many foods and dishes, but let’s see what other benefits it offers. I’m sure there may be some that you’re aware of, but there are also some that may surprise you. Take note of the raw honey listed below in the types of honey list. Even though honey is a sweetener, it helps to lower your blood sugar. There were studies done in 2004 that showed honey was responsible for decreasing glucose and increasing insulin at the same time. In addition, honey also showed that it raises your HDL good cholesterol and lowers your A1C and triglyceride levels too. Honey is also to be more effective when taken with your medications that you might be already taking. Subjects who were taking part in this study showed improvement with better antioxidant defense and an increase in their glycemic control. It’s important to note that while honey is beneficial in these ways, that you don’t consume too much because of the calories. But it will help your glucose levels. There has been research done into adding honey to the diet instead of replacing sugar with it. Now while honey is actually a sugar, it’s not going to drop blood sugar levels tremendously. It may best lower them slightly or just have them stay neutral. But it is still a better sugar choice than actual sugar itself. Avocado- This plant’s flowers have more like the taste of butter and appear to be darker in color. This honey is mostly used for dressings. Buckwheat- This honey is very good for your immune system. It works well as a better choice for you than cough syrup. Clover- This is one of the most common of honeys. It has an exquisite taste and is either an light amber colors or a light white color. The types of clover honey are White Dutch or Red Clover. Sage- This is another honey that tastes somewhat on the sweet side with a light white color. This honey comes from the sage flower and most times gets served with cheese. Orange blossom- I love this honey. It’s great to bake cookies and cakes with. It can be either pure or mixed with nectar from other citrus including lime or lemon. Raw- Since this is the pure form that hasn’t been pasteurized yet, it may be the best choice for controlling glucose levels. It is an all natural form that has glucose decomposition. It also helps with health digestion. * Throat and cough- Honey is great when helping you with your cough. I always take cough drops with honey in them too. At the same time it aids in soothing your irritated throat. It’s the pits when your throat hurts and you’re coughing too which adds to it. Buckwheat honey in particular is especially helpful. * Fatigue- Are you feeling tired or fatigued when you wake up in the morning? Have honey by spreading it on English muffin or toast or whatever your preference is. It will give you a boost of energy better than any morning drink can. You can even use it in your tea in place of sugar. * Cancer fighter- Seriously? Honey to fight cancer? Absolutely! There have been studies done that show that honey plays a big role in preventing the progression of cancer and tumors because it possesses properties that are anti-tumor and carcinogen preventing. * Digestion- Honey acts as a mild laxative in decreasing your chances of bloating, constipation, and gas. Because of probiotic or good bacteria it helps in reducing your allergies and encouraging the strength of your immune system. Using honey instead of sugar aids in decreasing any toxic effects in your stomach. * Cosmetic- Honey can be used as a rejuvenator for your skin and in addition can slow down the possibility of wrinkles forming. It also aids in the smoothing of your hair. There was a study done that showed that honey can be used for dry skin and pimples as a facial scrub and face wash.
* Heals wounds quickly- This is one benefit where honey really does the job of healing. 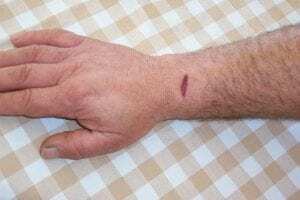 Research was done that concluded that a wound after post-op was healed with much acceleration and very little scarring. Remember hydrogen peroxide when you were a kid and mom used it for cuts? Well, it’s actually found in the properties of honey helping to kill the bacteria, speed up the healing process, and lower the risk of infection. * Immune system- Honey can provide many benefits but what is really impressive is that it can be a powerful booster for your immune system. It can help you with fighting disease and staying healthier by the improvement of your digestive system caused by its anti-bacterial properties and antioxidants. * Nutrient provider- You can get more nutrients for your calories than sugar provides. Honey includes manganese, zinc, potassium and magnesium, riboflavin, iron, copper, niacin and calcium. It’s obvious that honey is the choice over sugar. * Insect bites- Stings and bites from insects can be treated by honey with its anti-microbial properties. The microorganisms are killed off by the natural sugar in honey. You can get even more benefits by simply adding lemons to help prevent the growth of bacteria. Honey and lemon together can reduce the itching and swelling that occurs with insect bites. I can’t stand bugs and insects and mainly for this reason. Who needs bites, swelling, itching, and infection? I would much rather prevent these from happening if I can, but you can’t always elude the pesky things. Honey works great especially combined with lemons. * Ailments- In addition to cuts and bruises, honey also treats athlete’s foot, yeast infection, and arthritis pain. It can accomplish this because of its antiseptic properties which impedes the growth of certain bacteria and aids in having your external wounds be kept as free and clean from infection as possible. * Cholesterol- Honey also fights high cholesterol levels because of its antioxidants. This gives a better potential in protecting against heart disease. * Honey and vinegar- This combination is widely known as a home remedy for treating arthritis. * Your blood- Honey is good for your red blood cell count. Mixed with lukewarm water, you can drink it and benefit from the condition of anemia if that’s something you need to treat. You need to have sufficient amounts of oxygen in your blood so that your body can easily revitalize itself. This also has a positive effect on your blood pressure. So if your blood count is down because of it being deprived of oxygen, you can start to experience short breath, possibly depression, and fatigue. * Acne- If you want to thwart acne, you can use raw honey to help. You only need less than a teaspoon to rub between your hands and then gently smooth over your face. Leave it on for 5-10 minutes, rinse off, and dry. You can use this no matter what your skin type is. * Infections on your scalp- I find honey helps with itching of the scalp, dandruff, and dermatitis. I tried applying honey every other day by rubbing it in and letting it sit before I washed it off. It works. No more itching and dandruff for me. * Sleep aid- I think most of us either have or have had problems with sleeping. There are many reasons for this and some folks resort to drugs or sleeping pills. I have never taken any sleeping pill or drug to sleep. Sometimes just getting into a relaxing routine every night will do it. But when it doesn’t help honey can help because once you have honey, your insulin rises and triggers serotonin which the body turns into melatonin. This compound is what makes you sleepy at night. So, why not ditch the medications and sleep aids and make yourself a nice warm of decaf tea with honey at bedtime? That’s my choice. I don’t ever want to take a pill to go to sleep. * Nervous system- Honey is awesome for your nervous system because it boosts your brain function and aids in the developing of your entire nervous system. Studies have shown that a flavonoid known as catechin is able to delay the decline of your memory loss due to aging. * Appetite- There is a hormone in your body known as leptin that controls your appetite and honey decreases the level of leptin which will decrease the amount of calories you take in so you will lose weight which in turn lowers your blood sugar levels too. Abdominal pain- You can possibly experience severe abdominal pain by the consumption of too much honey. Blood sugar- It’s possible that your blood sugar levels can increase if you take too much honey. So just don’t overdo it. Stay with a regular dose of honey to keep your sugars under control. Blood pressure- Again, only have honey in small amounts because it can raise your blood pressure too. It’s all about quality not quantity. Honey is good for you, just don’t “binge” on it. If you find that your pressure is too low, then avoid honey altogether. Tooth decay- You should keep in mind that honey is after all sugar too. You don’t want to do damage to your teeth. The dentist makes enough money as it is! Prevention- If you are experiencing any internal bleeding or are taking blood thinners, then avoid honey at all costs. An ounce of prevention here. 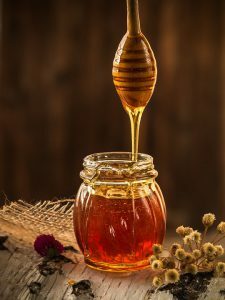 Medication interactions- I could list all the medication that could possibly interact with honey but I feel it’s safer for you to discuss taking honey with your doctor first. The doctor will know what is best for you here. Honey is very beneficial for you and honey and diabetes are connected, but honey must be consumed in small or moderate amounts. It’s important for your health but for diabetes it’s just a better choice than regular sugar. So while it may not affect your blood sugar levels to lower them as you may need, if you require something with more strength in lowering your glucose levels, this is what will do it! Thank you for reading and I hope that you learned about what honey can offer you. If you have any questions at all or would like to leave a comment, please do so below. I appreciate it. Have a happy and healthy! Black Beans and Diabetes- Why is This Superfood so Healthy? I love honey, I used to have a tablespoon every morning upon waking up. At times, I add it to my purely squeezed lemon juice as sweetener. Peanut butter sandwich with honey tastes really good too! I am aware of the many health benefits of honey but I didn’t know it can help lower blood sugar levels. And it also helps boost your immune system, that’s awesome. I really need to get in shape because I am working 12-hour night shifts. I know it’s pure honey that’s healthy so what about all these commercialized ones, do they also give the same health benefits as pure honey? What labels should we be looking to make sure we get the good quality? I love honey too and especially when it’s so good for you. You can put it on so many foods. It’s great when you have a sore throat too. But I so like it better than regular sugar which is the enemy! Honey can help lower blood sugar but only taken in smaller quantities because it is after all a sugar itself. Pure honey is better for you but the ones I mentioned in my article are beneficial as well. You should always read the ingredients and nutrition on the labels. Out of these: Honey choices I like the Nature’s Nate the most. I absolutely love honey. I use it in my tea and on toast almost daily. I had no idea about the uses of honey and the benefits for diabetics. I don’t have diabetes but I know someone that does so I will pass on this information to them. Definitely something they should be made aware of. Kind of off the main topic but I heard that if the honey bees use pollen from a weed called Ragweed, that the honey made from this weed is good for those people that have allergies to that weed. Have you heard this? I may search your site for more information about that. Thanks so much for the education. Honey is great! You can use it on almost anything. Anything that helps diabetes is a plus. It’s just watching the amount that you have. It has to be in smaller to moderate amounts. It’s good that you pass on the information because you never know who will benefit from it. As far as honey bees and ragweed helping with allergies? I can’t say that I am aware of that, sorry. Good luck and hope that you have a honey of a day! I am a type one diabetic and I am interested in the ways that honey can help lower blood sugar. At first thought, I would think that it would raise my blood sugar because it is so sweet. But if I understand correctly, taking it in small doses and regularly it can help keep it under control over time. Is there a recommended amount each day or a better time of the day to take it? I, of course, would talk to my doctor before changing anything but I just wondered what your suggestion or thoughts might be. I imagine it is definitely better than regular sugar because it is natural rather than manufactured or bleached. Hi James, Yes honey can be beneficial but in smaller amounts because it does contain fructose. Honey has minerals and antioxidants and anti inflammatory effects that sugar does not. But the important thing to keep in mind is to watch the carbs, not the sugar in honey. One tablespoon of honey has 17gm of carbs, 64 calories, and 8 grams of fructose. My biggest suggestion is to always check with your doctor first. They are the professionals. Honey is good for your blood sugar in small quantities. I hope this helps! Thank you for your comments!